The Torne River produces the perfect source to harvest ice for building Icehotel – the water has very few impurities and the current of the river means that the speed is perfect to carry away any of the air bubbles produced as well as enabling the water to freeze. At the end of each season in April, the seasonal Icehotel literally disappears and melts back into the Torne River. Except of course for the new Icehotel 365, which remains open year round with sub-zero temperatures maintained by solar power. Each year 55 seconds of the river current returns back to the river after the hotel has melted in the spring – with only 5 second’s worth being lost due to the ice being exported for ice projects outside Swedish Lapland. In March the Icehotel harvests ice from the river for the following season’s build which is stored in a giant warehouse at Jukkasjärvi (-5˚C all year) until winter. 2500 blocks of ice are harvested each year – each one weighing 1.6 tonnes and measuring 210 x 100 x 80 cms – this equates to only 10 seconds of the current in total. The Icehotel itself uses 1000 ice blocks, that’s 1,600,000 kg – or 1600 tonnes – the rest is used for export. Almost 1 million ice glasses are produced each year, also harvested from Torne river ice. These are used at the Icehotel itself and exported to be used in Icebars by Icehotel located around the world. The Icehotel is built out of ice, snow and snice – snice is made out of snow, water and air. It is made from snow cannons and has a higher density than snow itself making is stronger and perfect for building purposes. The small ice crystals with air in between them in the snice makes it as white as snow and is insulating because of the air. It weighs 500-600 kg/m3. Ice 920 kg/m3. Snow 200 kg/m3. 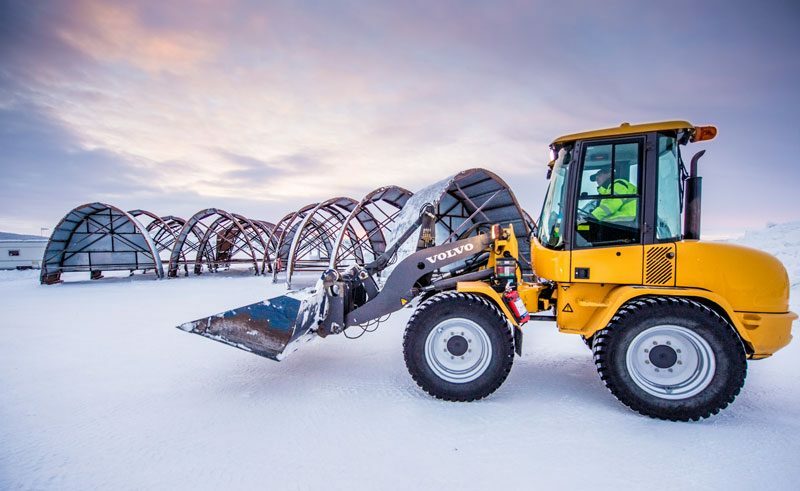 The tools used to build the Icehotel are tractors, chainsaws and razor sharp chisels. Winter 2014/15 was the 25th Icehotel. Construction begins in November and is completed in December. The first guests arrive in mid December on Discover the World’s exclusive direct flight from Heathrow to Kiruna which takes less than 3.5 hours. Kiruna is just a 20 minute drive from the hotel. That means in the same time it could take you to drive from London to Plymouth, you could be touching down in Swedish Lapland – 200km north of the Arctic Circle. Ice Suites are designed by artists from all around the world. 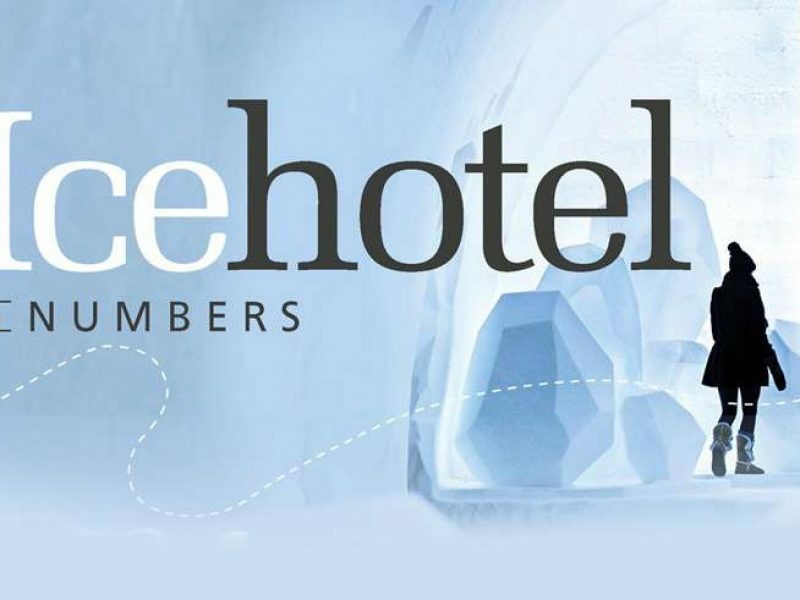 Each year 200 artists apply to create a suite at Icehotel but only about 40 are selected. First of all a metal frame is used (covered with snice – sometimes snow). The snow, ice and snice are packed to make the structure stable and then the frame is removed when all the building materials have been used. The frames are taken out after one or two days when the material is frozen and stabilized. After the main structure has been made for each suite, it is handed over to the individual artists who will then create a totally unique interior using just ice. The bed in each ice room is made out of blocks of ice, a wooden base and a mattress covered with reindeer skin. Instead of a door, guests pull a curtain in front of it. The snow walls are very sound isolating so don’t worry about any snoring neighbours! There are 4 types of ‘cold rooms’ at the Icehotel – Snow Rooms, Ice Rooms, Art Suites and Northern Lights Suites. The average temperature in one of these rooms is -5°C to -7°C (regardless of whatever temperature it is outside, 0˚C or -40˚C) – but don’t worry, guests wrap up warm in their long johns and hats and snuggle into their cosy polar sleeping bag. Around 7.30 am, you will be awakened by one of the hotel guides and served hot lingonberry juice in bed. The Ice Palace in the James Bond film Die Another Day was inspired by the real-life Icehotel in Jukkasjärvi. The glacier cave part of the movie Smilla’s Sense of Snow, directed by Billie August, was built and shot at the Icehotel. Fly direct on our exclusive #IceFlight and discover the magic of the world’s coolest hotel for yourself. Contact our team of Nordic Travel Specialists direct today.